Original / Genuine Original W650BAT-6 Battery 6-87-W650S-4D4A For Clevo Laptop 4400mah(Li-ion 11.1V 4400mAh, 48.84Wh ). Fast Shipping in USA. 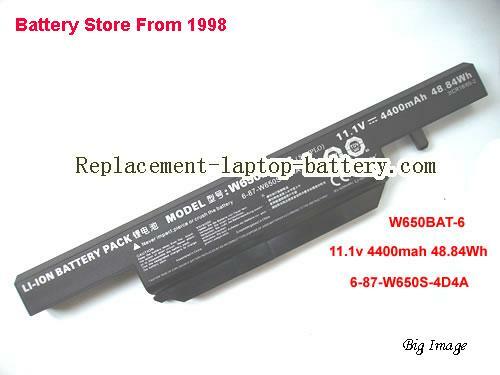 This is a Original W650BAT-6 Battery 6-87-W650S-4D4A For Clevo Laptop 4400mah. 6-87-W650-4E42, 6-87-W650S-4D4A, 6-87-W650S-4D4A2, 6-87-W650s-4D4A3, 6-87-W650S-4D7A2, 6-87-W650S-4E7, 6-87-W650S-4E72, 687W650S4D4A2, 687W650S4D7A2, 687W650S4E7, 687W650S4E72, W650BAT-6, W650BAT6, W650EH, . Online shopping for high quality and cheap Original W650BAT-6 Battery 6-87-W650S-4D4A For Clevo Laptop 4400mah. All CLEVO Laptop Computer Batteries and CLEVO Replacement Laptop Batteries are 30 Days Money Back, 1 year warranty.